A look at the behind the scenes and inner workings of couture accessory line, Kata Banko Couture from the perspective of head designer, Colleen Bankovich. Here are a few more behind the scenes shots from Taryn Penrose. The Alice Crown features hand cut, hand painted and hand wired flower petals onto our signature hair band. The paint gives the illusion of ceramic without the weight. Special thanks to our stockist Mood and Muse Boutique for putting together such a gorgeous shoot! 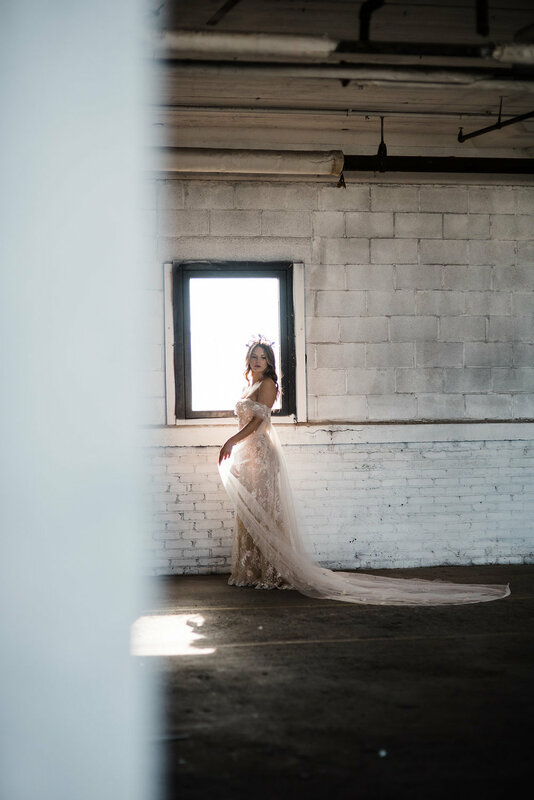 The 10:37 crown in Garnet crystal sand looks perfect with Alexandra Grecco's ethereal gown. Photography by Nikki Santerre and Shannon Moffit. This gorgeous editorial features custom accessories adapted from the #AxisCollection. The fist bridal head piece you will see is a 10:37 crown adorned in Garnet crystal sands and Swarovski crystals. The second bridal hair accessory is the Cosmic Love crown featuring Swarovski pearls accented with tiny sparkling Swarovski crystals. The other accessory to note is the Atticus ear cuff, crafted from custom metal stampings and accented with Swarovski pearls. The juxtaposition of the haute couture gown and couture accessories give this such a fashion-forward look for a bridal editorial.